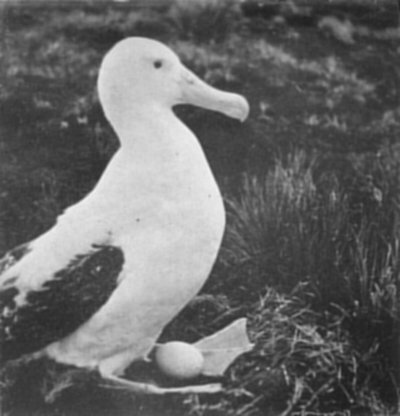 A rare picture of a Wandering Albatross displaying its egg on Marion Island. AFTER photographing the sea-elephants and albatrosses we went in search of a penguin rookery. We had no difficulty in finding one, for the penguins seem.to occupy every beach, no matter how small or rocky, on the islands. We were to learn, in fact, that they form the principal population, their numbers running into tens of thousands. We found a rookery at the waterfall to the north-west of the camp. It was a small one as rookeries go, only a few hundred birds being about. To us, though, who were familiar only with the little Jackass Penguins peculiar to the Cape, swimming singly or in small groups in Table Bay or nesting in their burrows on Dassen Island, our first visit to a Marion Island rookery was fascinating. Here we found the most marine of all birds carrying on a life that was different and, in the social sense, quite highly developed. We found four different species sharing the same rookery yet segregated not only from each other but within individual families, too. was about 15 feet in diameter and had been cleared of grass and worn smooth by the thousands of tiny penguin feet during the course of many generations. It was used only by the breeding birds and their young. The King penguins, which grow to a height of 38 inches and are the tallest of the family except for the five-foot Emperors of the Antarctic Continent, stand upright throughout the seven weeks they are incubating their single eggs. These they place on their feet and cover. with a flap of loose skin, forming a kind of pouch. The other penguins sit on their eggs and hatch two or three at a time against the single one of the King's. The Kings, however, fight more fiercely to prevent their eggs being taken from them. We noticed that many of the birds were moulting. This considerably spoilt their normally sleek and clean appearance. They seemed conscious of this, too, for those that were moulting seemed always to keep together and not to mix with the birds of clean plumage. Though in some respects they lived as a single community, each branch of the family had its own portion of beach, and trespassers were usually savagely pecked until they fled, screaming. They seemed to use their beaks on the slightest provocation, and were constantly quarrelling among themselves. The Rock-hoppers were particularly savage and seemed friendily disposed towards none. It was comical to watch their method of progress on land. They would hunch their bodies forward and hop, with both feet held close together, from rock to rock - hence their name. All the other species ran or waddled with their bodies bolt upright. When pursued and desperate to escape they would all throw themselves down and "row" by beating their flippers violently on the ground. Of course in this way they made less progress than ever. use of their beaks (drawing blood quite easily) but they beat our hands violently with their flippers, which could produce quite a sting. The penguins are by far the most vocal of all the birds on the islands. I was amused by one of their " musical" efforts. A crowd of them would be standing around in silence, apparently meditating. Suddenly one would start squawking raucously. Another nearby, whom I presumed to be his mate, would turn and face him, and squawk back. Then they would energetically try to cry each other down, heads held high, beaks wide open, and flippers bent behind their backs. They would keep this up for several minutes, and then another penguin would squeeze his way through the crowd and take up his stand facing the performers, a foot or two away. Whether he was adjudicating or remonstrating one could not tell, but the performance would stop abruptly. The originator would then put his head down, and, looking at the ground and with hunched shoulders and flippers held in front of him as if he were clasping hands, he would walk round and round the other while the object of his attention looked skywards and pretended complete disinterest. The ceremonial over, they would rejoin their fellows in meditation. The larger birds of the islands feed upon the smaller, and penguin chicks that wander away from their mothers' protection become a delicacy that is much sought after. While we were at the rookery one of the construction party's medical orderlies Sergeant Ron Kinsella, who had joined us, saw what he thought was a Skua gull mercilessly attacking a chick. He brained it, but not before it had killed its victim. Closer examination revealed it to be a Sooty Albatross, a species somewhat smaller than the Wandering Albatross, and fairly common on the islands. The bodies of the birds were left lying on the rocks, and in a few minutes Skuas were eating the bowels of the chick. They left the rest of it untouched, and ignored the albatross. albatross family, are found only in the southern hemisphere. They inherited the name from the Great Auk or Garefowl of the northern hemisphere, which was exterminated by sealers and fishermen, and which they closely resemble in appearance. The sealers on Marion and Prince Edward last century slaughtered many thousands of penguins to extract their oil or take their skins, which were made up into rugs and mats at the Cape. To-day the Cape's Jackass penguins are commercially valuable because their eggs are a delicacy, and the supply is never able to cope with the demand. The penguin population of South Africa's new islands is therefore a potentially valuable asset, for the eggs remain fresh for a good while, and the laying season is toward the end of the year, which is the off-season for the Cape penguin. Of more immediate value are the King penguins as zoo and museum specimens. These beautiful birds are so rare in the inhabited parts of the world that the London Zoo not long ago paid £250 apiece for a few live specimens. But they are cold-weather creatures, and very few indeed have survived the crossing of the Equator. bridge. McMurray and Berelowitz had also related how, when walking together on the island, a determined attack had been made upon them by a Skua. McMurray's first shot had misfired, his second missed and the bird was only two arm-lengths away when his third went home and feathers scattered as it lurched in its flight. But it flew on to settle 50 yards away. When balked in attack, the Skuas did not give in easily. They invariably settled on the ground close in front of their intended victim, and stared fixedly at it. Some considered that they thus tried to hypnotise their prey preparatory to pouncing again. Even after abortive attacks on men the birds would settle three or four yards in front of them and eye them belligerently. They seemed quite unconcerned at the possibility of retaliation, and moved out of the way tardily and unwillingly when approached. The men in the water parties, each of whom now received eight rounds of ammunition for defence against Skua attacks during the trip, found it easy to bag such fearless birds. One man specialised in shooting two with the same bullet by manoeuvring into a position where one was behind another. Twice he killed two at a time in this way. The Skua is known as the seafaring Eagle, for it closely resembles the land bird. They nest on the ground, never building their nests close together, so that each may have a clear hunting-ground in the vicinity. Favourite nesting-places are near penguin rookeries and the nests of small birds, upon whose eggs and young they feed. One of the Transvaal's occupation party made his first acquaintance with their sneaking habits when he was levering a King penguin away in order to take its egg. With a rush of wind and beating of wings a Skua grabbed the exposed egg in its beak and flew off with it before the surprised sailor realised what was happening. morsel in its beak. The Skua will pounce upon its neck, pecking and tearing with its talons until the food is dropped, when the thief will dive swiftly and often catch the falling morsel in its own beak before it reaches the ground or the water. Though it is less than a quarter of its size, the Skua will sometimes attack even the Giant Albatross. One did so near the Gamtoos soon after she anchored. Somehow the albatross got the better of its attacker, and the crew of the coaster, hearing screaming and the sound of wildly beating wings, turned to see four huge albatrosses pecking and tearing at a blood-stained body in the water. When the Transvaal's party took up residence on Marion they were puzzled at first by extraordinary sounds that came from the ground around, and from almost under their feet, at night. They sounded like half-smothered cries, wails and shrieks, and they were mingled with the sound of fluttering wings. They were mystified also at the reason why so many birds flew around throughout the night. Eventually they discovered that the noises were made by petrels of various species that had burrowed into the ground in order to lay and hatch their eggs there. One of the adult birds would remain in the burrow quietly all day incubating the egg, while the other foraged at sea. The foragers swarmed back in the early evening and were welcomed noisily by their mates. The disturbance would continue throughout the night as birds came and went, but by dawn the foragers would be away again and everything would be quiet once more. Birds of the Ocean, W. B. Alexander's detailed directory of ocean birds, does not mention it. We found the Sheath-bill to be even more curious than penguins and to be completely fearless of man. They seemed to live with the penguins and to be the scavengers of their rookeries. Wherever there was a group of penguins there always seemed to be one or two of these birds about. When we appeared they would come running up to us, apparently hoping for titbits to eat. As they pecked on the ground they would allow us to fondle them, and this did not seem to distract them at all. While exploring further in the neighbourhood of the penguin rookery I experienced for myself the treacherous nature of the ground on which we walked. I was wary of possible bogs, but the grass and moss ahead of me seemed firm enough as I started to cross a slight depression in the ground. Unexpectedly my foot squelched down in soft mud to ankle depth, and before I could stop myself the other foot had followed knee deep and I was flat on my face in the bog. Fortunately I had not gone in far, and with Sara's assistance I soon scrambled on to comparatively firm ground again. But recovering and cleaning my camera and tripod and removing as much as possible of the mud and green slime that covered my clothes took quite a time.